Ari Puttu as you all know is a favourite breakfast item for Keralites. Puttu has many varieties like Rice Puttu, Wheat Puttu, Ragi Puttu, Corn Puttu, Rava / Sooji puttuetc. which are all very popular now. This Ari Puttu is special, soft and tasty and you will love the Matta Ari flavor. You must be wondering what is so special about Puttu? Usually Puttu is made with Raw rice powder, fried and then mixed with water to make crumbled Rice Puttu mix, which is then mixed with coconut to make Puttu. This Ari Puttu is a different version, where you soak the rice and use the raw rice powder to make super Ari Puttu. No frying and no mixing! Sounds easy, right? Well, to be honest, when my cousin Linda asked me to try it, I was little skeptical as this was totally new to me. 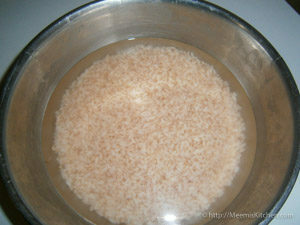 I just tried with one glass of rice to test and see if it was good and the result was awesome! The Ari Puttu was so soft and tasty; I was happy as the Puttu was ready in minutes. No mixing required, just soak the rice and grind. How easy is that? Every bit was relished and as I had no soaked rice left, I had to make extra Ari Puttu with fried rice powder and nobody wanted that!! Now, I can’t even think of making Puttu the other way. It is that fantastic! This recipe is from my darling Ammaunty , who always amaze me with her culinary skills! You may also like my other variety breakfast recipes like Dosa Pizza, Irachi Puttu, Neer Dosa, Idiyappam, Kerala Palappams, super soft Idlis, Poori, Bhature etc. You can have Ari Puttu with Kadala curry (try my tasty recipe with Thengapaal), Egg Curry, Chicken with gravy or Bananas. Try this special Matta Ari Puttu and let me know how it went for you. Wash and soak the rice overnight. Once you are ready to make the Puttu, drain the rice and keep aside. Immediately grind it in a mixer with little salt. 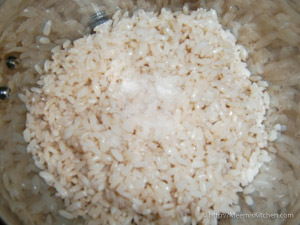 Do not add any water as the soaked rice has enough moisture. 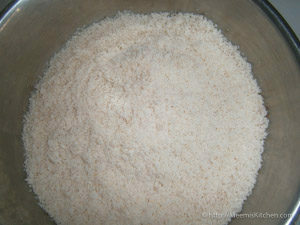 Grind for few seconds, scrape the rice on the sides and grind again till you get a coarse powder. Do not grind for more time or you will get lumps. 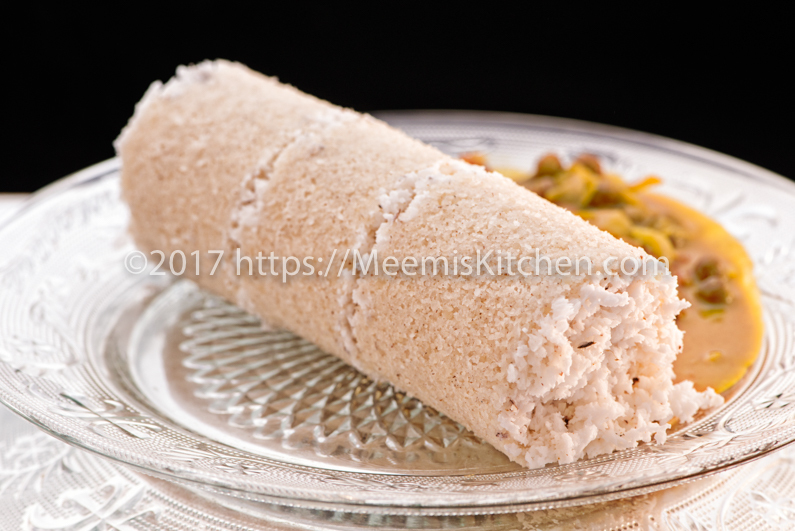 In the Rice Puttu Kutti or Puttu steamer, first layer with scraped coconut and then fill little rice powder and again layer with coconut and rice powder and cover with coconut layer. Steam for 5 minutes or more and you get soft and tasty Matta Ari Puttu. No mixing with water, no lumps! Your job made easy!! Enjoy with Kadala curry or Bananas. I have used Matta Ari for making this Ari Puttu. You can use any par boiled rice of your choice. Drain the rice and grind without any water. The soaked rice would have enough moisture to make the perfect Puttu. Add enough salt while you grind. Do not over crowd the mixer with rice. For best results, grind for few seconds, scrape the sides and grind for few more seconds. The rice should be coarsely ground, if you grind for more time, you will get lumps. Coarse grains give you the perfect texture. Hope you like this Matta Ari Puttu recipe. Please do put in your comments or share with your friends with the help of buttons on the side. It would definitely encourage me!! God Bless!